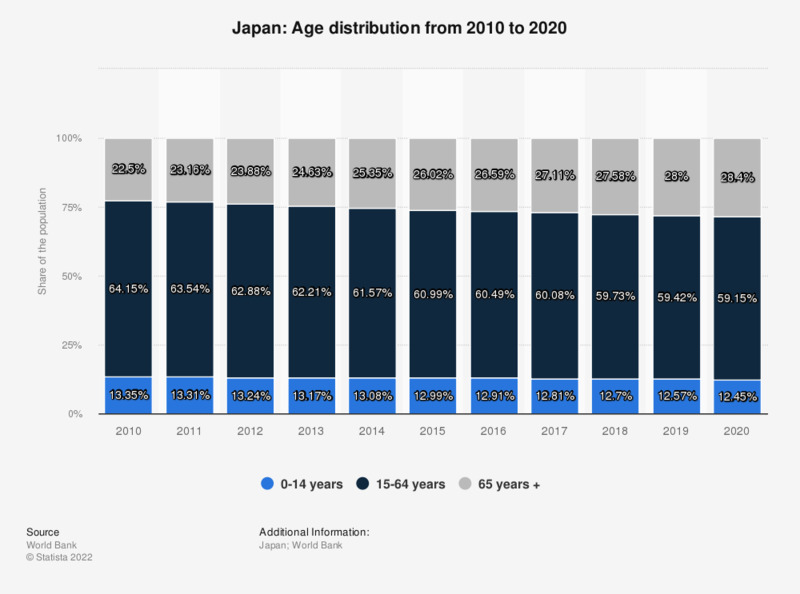 Over the last decade, Japan’s population has aged more and more, to the point where more than a quarter of Japanese were 65 years and older in 2017. Population growth has stopped and even reversed, since it’s been in the red for several years now. With almost 30 percent of its population being elderly inhabitants, Japan is considered the “oldest” country in the world today. Japan boasts a high life expectancy, in fact, the Japanese tend to live longer than the average human worldwide. The increase of the aging population is accompanied by a decrease of the total population caused by a sinking birth rate. Japan’s fertility rate has been below the replacement rate for many decades now, mostly due to economic uncertainty and thus a decreasing number of marriages. There is no real mystery surrounding the ripe old age of so many Japanese. Their high average age is very likely due to high healthcare standards, nutrition, and an overall high standard of living – all of which could be adopted by other industrial nations as well. But with high age comes less capacity, and Japan’s future enemy might not be an early death, but rather a struggling social network.